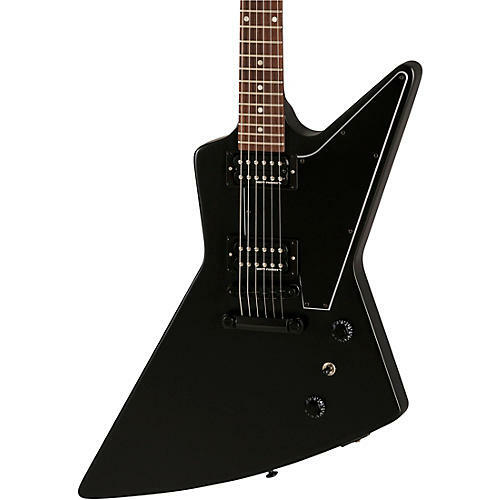 The Gibson Explorer B-2 takes the trail-blazing characteristics of the Explorers originally introduced in 1958, which made those rare and desirable guitars so far ahead of their time and wraps it in a stealthy, black satin finish. This B-2 version features a solid mahogany body and set-in mahogany neck with fast, comfortable SlimTaper profiles and rosewood fingerboard. Sonically, high-output Dirty Fingers + humbucking pickups combine with the classic Gibson hardware for superbly aggressive tone and sustain that will speed the beat of any shredder's heart.